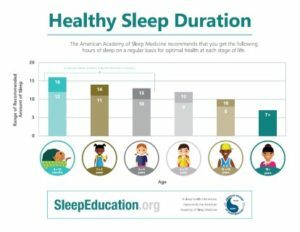 For years, there has been debate regarding the number of hours our children should be sleeping for optimal health. The sleep requirements for youngsters varies depending on age and is quite different from the hours needed by adults. In my own personal experience, I have found that my sleep requirements have changed dramatically as I have gotten older and previous notions suggesting that everyone needs 8 hours of shut-eye is not particularly accurate. After much deliberation, a panel of the nation’s top sleep experts, have come to agreement on pediatric sleep expectations. These recommendations have been made official by the American Academy of Sleep Medicine. Click on graph for PDF version. Previous postEmployers: Improve Productivity and Company Success!